Spirit Clay: Robots and Bloggers of the World Unite! Stephanie of Clay Baboons is my hero! Her latest post makes my little bloggy/roboty heart soar! 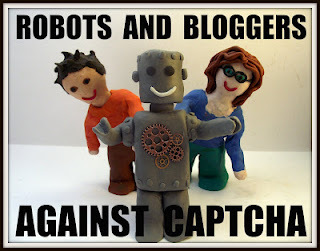 I'm joining her cause to stop Captcha from stunting our joy of commenting on fabulous blogs! Ugh! Captcha has broken my spirit for the last time! I'm shedding the pseudo protection of that acronym for a new empowering one - RABAC!